In August of 2010, Canon released the 8-15mm ƒ/4 L USM fisheye zoom lens. The lens is a first for Canon, offering multiple focal lengths in a fisheye configuration. It does not use a variable aperture, instead offering a maximum ƒ/4 aperture across all focal lengths. The lens is designed to work on all of Canon's APS-C, APS-H and full-frame camera bodies, as vignetting is a fact of life with fisheye lenses. Unfortunately, our testing software does not work with fisheye lenses, so we don't have quantitative results for this lens. The Canon 8-15mm ƒ/4 L USM fisheye ships with the EW-77 lens hood, and is available now for approximately $1,500. 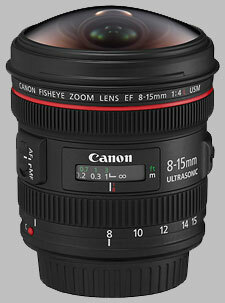 The Canon 8-15mm ƒ/4 L USM fisheye presents a very useful design. Fisheye lenses have traditionally been designed in one of two categories: the circular fisheye lens, which produce a full 180 degree image both on the entire frame, which requires a very wide lens (8mm on full-frame, 4.5mm on sub-frame), and results in massive vignetting on the left and right sides. 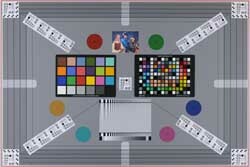 Our test chart, shot at 8mm and f/8 on the full-frame Canon 1Ds Mark III. 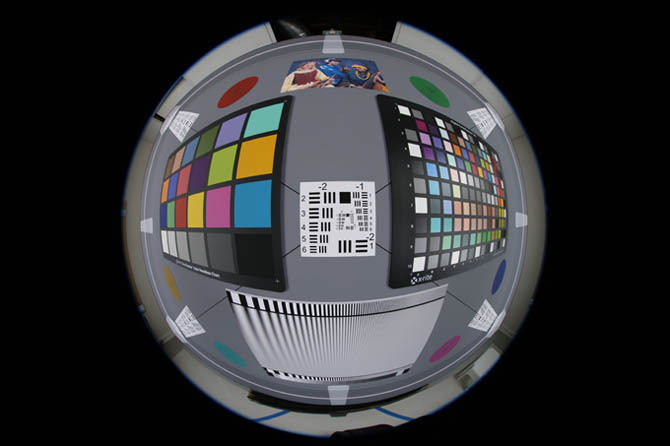 The second category of fisheye lens, the full-frame fisheye, fills the frame horizontally with 180 degrees of the scene, so that vignetting on the left and right sides is limited: this requires a less wide focal length (15-16mm on full-frame, 10-12mm on sub-frame) and only produces vignetting in the corners, if at all, depending on the design. As Canon has integrated both of these focal lengths into the design of the 8-15mm zoom lens, users will have their choice, and can produce both fisheye looks with a single lens. Our test chart, shot at 15mm and f/8 on the full-frame Canon 1Ds Mark III. Looking at sample images, there is some chromatic aberration to speak of, but it is only evident in the extreme corners, presented as magenta-blue fringing in areas of contrast. As a result of Canon's USM focusing system and the relatively short focus throw, it takes well less than a second to go through the focusing range. The lens makes almost no noise as it does this. As well, autofocus results can be overridden at any time by simply turning the focusing ring. This isn't exactly the lens you want to go to for macro work, but it does offer 0.39x magnification at its close focusing range of six inches. Like all L-series Canon lenses, build quality on the EF 8-15mm ƒ/4L USM is exceptional, incorporating seals for weather and dust-resistance. It's fairly heavy - 540 grams (around 19 ounces) but not especially large, balancing well on full-frame and APS-C based camera bodies. The lens contains UD and Aspherical lens elements, and a fluorine anti-smear coating is applied to the front and rear elements. The lens is finished in Canon's stippled black matte texture. In addition to focusing and zoom rings, the lens has two control features: a switch to enable or disable auto focus on the lens (marked AF / MF), and a zoom limiter switch. The switch operates much like a focus limiter switch, but for the zoom ring; what it does is only allow the lens to zoom between 10mm through 15mm. 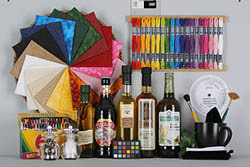 This is so that if you are using an APS-C camera the image will fill the whole frame. 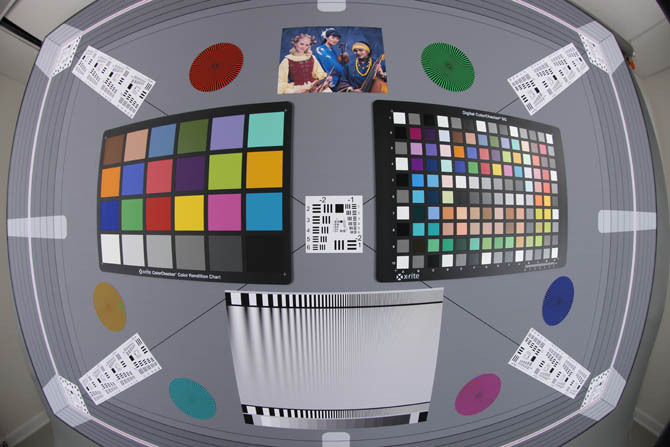 If the limiter was not activated on an APS-C camera, you would be able to zoom it to 8mm, and have a lot of corner vignetting in your picture. The lens features a distance scale, marked in feet and meters, located under a plastic window. It has no depth of field scale, but it does have an infrared focusing mark. The lens doesn't accept front-mounted filters, but it does take rear-mounted gel filters, that slide into a small holder. The zoom ring is rubber with large raised ribs, about a half-inch wide. It is located near the camera end of the lens. The zooming action is firm but smooth, in other words, just right: zoom creep is not, and is not likely to become, a factor for this lens. The lens design is all internal, thus there is no lens extension during zooming. It takes a little less than ninety degrees to turn through the whole zoom range. The focus ring is also rubber with slightly smaller ribs and is located at the far end of the lens; it's a bit thinner than the zoom ring, about 3/8'' wide. The ring has about ninety degrees of turning action, and this relative short throw results in very fast autofocus performance. The focusing ring ends in soft stops on either end of its range, meaning a slight increase in resistance alerts you that you won't focus any further. The EW-77 lens hood is petal-shaped and does not reverse on the lens for storage. It stays in its normal position so that the lens cap can be snapped on to protect the protruding front element; the lens hood can be removed, but the cap cannot be attached to the lens without it. At the time of writing, Tokina has been the only supplier of a third-party fisheye zoom lens, however, there are a number of prime fisheyes to choose from. Offering a full 180 degree frame in the horizontal perspective, the Canon 15mm fisheye is a bit long in the tooth (it was introduced in 1987) but is still available today. Tokina's lens offers a similar experience to the Canon 8-15mm, but not quite as wide, and not quite as expensive. The 'DX' moniker shouldn't be confused with Nikon's DX format, as the lens is compatible with full-frame bodies. Sigma offers two lenses for full-frame users, the 8mm for full 180 degree horizontal and vertical coverage, and the 15mm ƒ/2.8 for 180 horizontal coverage. For sub-frame users, Sigma offers the 4.5mm ƒ/2.8 for full 180 degree coverage in both horizontal and vertical planes, and the 10mm ƒ/3.5 for 180 degree coverage in the horizontal plane only. While we can't tell you quantitatively just how good the Canon 8-15mm &131;/4 L USM Fisheye lens is, we can say that it's both a versatile and fun lens to use. It's basically two fisheye lenses in one, offering full horizontal and vertical 180 degree coverage on full-frame bodies, and a more conservative horizontal 180 degree coverage on all of Canon's EOS lineup, be it full-frame, APS-H or APS-C body. True fisheye for both round and square image. Great for macro. Object can touch the front lense. Great sharpness - tested on 5Dmk4. L quality and protection. Front Cup and blend can be easily dropped, making front lense unprotected. Needs a box for entire lense, like 135 F/2. Use it mostly outdoors and for mid-size macro. Great lens with more functionality than the previous 15mm! A VERY UNIQUE lens indeed! While a fisheye isn't for everyone, I find that if you're in a rut photographically, put this baby on your camera! If that doesn't get you going, I don't know what will. The 8mm end provides a great true fisheye on full frame (5D MkII), and the same view as the previous 15mm fisheye (which I also own--and am presently selling on eBay). The view on a Canon 60D for example gives you a true fisheye effect at a rate of 12.8 mm. While the 10-22mm Canon is fine, it doesn't begin to compare optically, or otherwise with the 8-15mm lens.